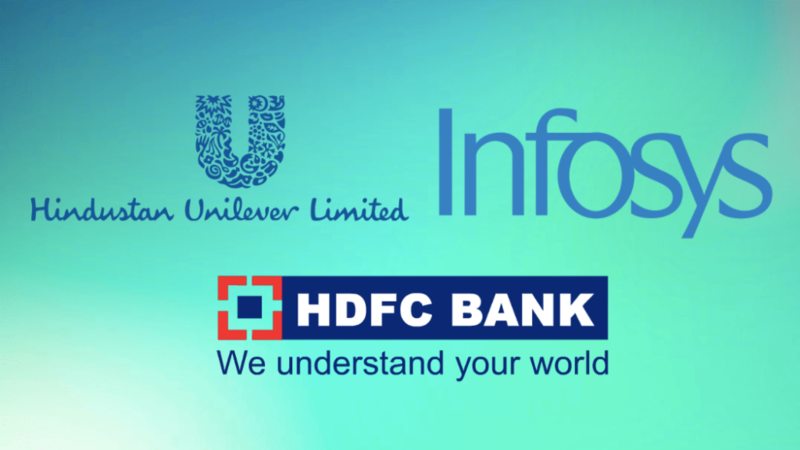 Is it a Good Strategy to Buy One Stock of Infosys, HUL & HDFC Bank Per Month? Many times it becomes difficult to find the right time to enter a stock? Finding whether the company is undervalued or over-valued can be a tedious job. Obviously, here we are talking about entering into a fundamentally strong company that has a good track record of past performance and fantastic future growth potential. However, valuation is a significant part of investing and should be given utmost importance while making your investment decision. In this post, we’ll discuss whether it is a good strategy to buy one stock of Infosys, HUL & HDFC Bank per month? But, before learning further regarding this strategy, let’s quickly analyze the businesses of these three companies mentioned in this post. Infosys: It is a leader in the Information Technology Industry. 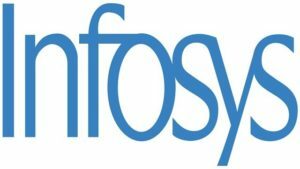 Infosys is the second-largest Indian IT company by 2017 revenues and 596th largest public company in the world concerning revenue. It provides business consulting, information technology and outsourcing services. Currently, the market capitalization of Infosys is Rs 275,866 Crores and has given an amazing return to its shareholders in the past. Also read: How to Earn Rs 13,08,672 From Just One Stock? HUL is a market leader in the personal care industry. It has a substantially strong brand value with products like Lux, Lifebuoy, Surf Excel, Rin, Wheel, Fair & Lovely, Pond’s, Vaseline, Lakmé, Dove, Clinic Plus, Sunsilk, Pepsodent, Closeup, Axe, Brooke Bond, Bru, Knorr, Kissan, Kwality Walls and Pureit. HDFC Bank– HDFC Bank is India’s leading banking and financial service company. It is India’s largest private sector lender by assets. 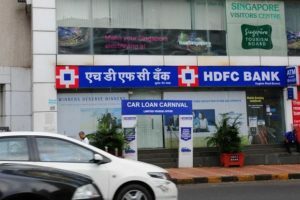 HDFC Bank provides many products and services which includes Wholesale banking, Retail banking, Treasury, Auto (car) Loans, Two Wheeler Loans, Personal Loans, Loan Against Property and Credit Cards. Read complete analysis of HDFC Bank here. Disclaimer: This is not a stock recommendation. The examples used here are just to explain the strategy of monthly investing in diversified stocks. Please research the stock carefully before making any investment decision. Why can this strategy work? “A good business is not a good investment if you overpay for it” -Warren Buffett. What Mr. Buffett simply means is that if you buy a wonderful stock at a high valuation, the chances are that it will fall down to reach its real intrinsic value in future. (At a particular time in future, people will realize the stock’s true worth and the price of the stock will fall to reach its intrinsic value.) Therefore, even a good company doesn’t guarantee a good return if you overpay to purchase that stock. Nevertheless, this problem of entering stocks at their true price can be avoided by purchasing an equal amount of stocks each month. It’s a fitting idea to invest monthly in diversified stocks. It will help you to avoid the dilemma of timing the market. You’ll be purchasing stocks on both the scenarios- whether the market is up or down. Suppose a stock is going down week after week. Here, you have studied the stock and know that it’s fundamentally strong and capable of giving great returns in the long term. In such scenario, by consistently buying the stocks every month, you are averaging down the purchase price. Similarly, if the stock is moving upwards every week, then again there can be few possibilities. Either you don’t buy and miss the opportunity of entering an astounding stock. Or purchase that stock at a high valuation. However, if you plan to invest systematically in that stock, you can avoid both these scenarios. You can make your position in the stock alongside reducing your purchase price by averaging down. Investing in just three stocks cannot be considered a diversified portfolio. Undoubtedly it is better than investing in only one stock. Nevertheless, if you want to reduce the risk, it’s better to invest in at least 4–5 stocks. You might need to readjust your portfolio in future— Let’s say, one of the stock starts performing exceptionally well compared to the other. Here, the net allocation in that stock will increase significantly, and it might be possible that the distribution of other shares would become too little to affect your overall portfolio. Therefore, here you need to readjust your portfolio (add/sell) in future to make all the stocks equally proportionate to keep your portfolio diversified. Last and biggest drawback- It’s really difficult to implement this strategy. Would you invest monthly in a stock if it’s price is going down consistently for the last one year? The problem is that people start to lose their patience and confidence (with time) in such scenarios. To make this strategy work, you need to follow this approach strictly. New to stocks? Confused where to begin? Here’s an amazing online course for beginners: ‘HOW TO PICK WINNING STOCKS?‘ This course is currently available at a discount. Although investing equal amount monthly in fundamentally strong large-cap stocks seems like a good idea. However, this strategy has few drawbacks as discussed above. Nevertheless, as long as you’re are monitoring your portfolio actively and re-adjusting your portfolio timely, this strategy can help you avoid the problem of timing the market and buying overvalued stocks. Moreover, this strategy is more useful if you are investing for long-term (+15-20 years). This is because here you have averaged out the extremes (lowest and top-most price) and purchased the stock at a correct averaged price. If the business remains excellent and profitable, this strategy will undoubtedly give great returns to the investors. Also read: How Many Stocks Should you own for a Diversified Portfolio? 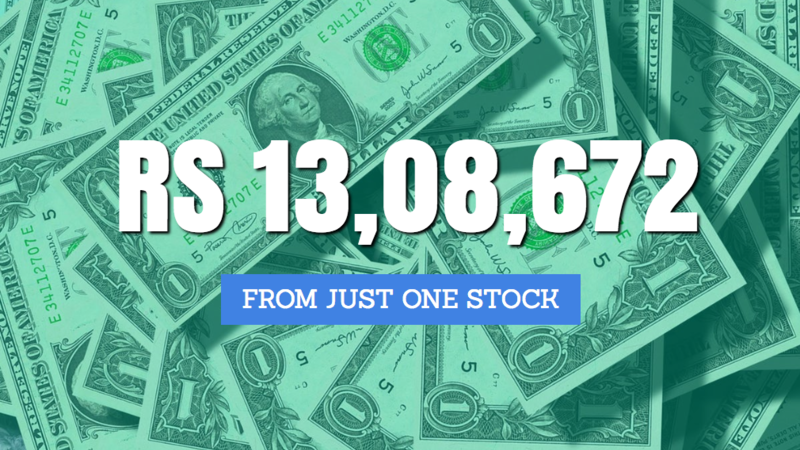 How to Earn Rs 13,08,672 From Just One Stock? Have you ever considered getting a deposit of Rs 13,08,672 per year in your bank account by doing nothing? And in this post, we’ll discuss how a long-term investor can earn over Rs 13,08,672 per year just by purchasing good stocks at a decent price and holding it for a very long time horizon. Infosys became public in February 1993 and started issuing its shares at Rs 95 per share. Since then, this company has given seven bonuses and one stock split. In simple words, it means that if you had bought 100 shares of Infosys in 1993, today you would own 51,200 shares. Suppose you purchased 100 shares in 1993. Your initial investment would have cost you: 100 shares x Rs 95 = Rs 9,500. Today, the market price of one share of Infosys is Rs 1,181. Worth over Rs 6.04 Crores today. Your small investment of Rs 9,500 would be worth over Rs 6.04 Crores in 25 years. Also read: Why Warren Buffet Suggests- ‘Price Is What You Pay, Value Is What You Get’? In the last 25 years, Infosys has given decent dividends to its shareholders. For simplicity, let’s calculate the dividends earned for the last two years only. Assuming that you bought 100 shares of Infosys in 1993, it would have turned out to be 51,200 shares by now. Now, let us calculate the annual dividends. Dividends worth Rs 13,08,672 in just an year. Also read: How ‘Not’ to Kill The Goose That Lays the Golden Eggs? This is the best example to show you the power of holding good stocks for long term. Besides Infosys, there are a number of good stocks in the Indian share market which has given even better returns to its shareholder for over decades. Overall, you can create an amazing wealth if you focus on buying amazing stocks at a decent price and have the patience to hold it for the long term. Value investing works- may be not in short term, but definitely in the long-term.